PM Narendra Modi, who met Infantino on the sidelines of the G-20 Summit here on Saturday, shared a picture of the blue jersey, with his name on the back, on Twitter. Buenos Aires: Prime Minister Narendra Modi met FIFA president Gianni Infantino, who gifted him a football jersey with his name on its back. 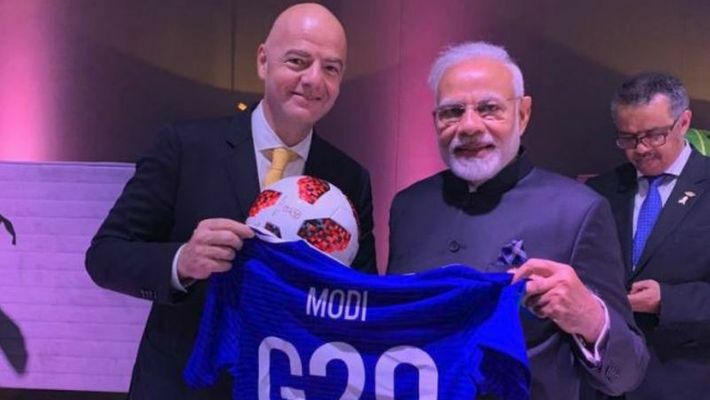 Modi, who met Infantino on the sidelines of the G-20 Summit here on Saturday, shared a picture of the blue jersey, with his name on the back, on Twitter. "Impossible to come to Argentina and not think about football. Argentinian players are tremendously popular in India. Today, received this jersey from @FIFAcom President Gianni Infantino. I thank him for the kind gesture (sic)," Modi wrote on Twitter. During ''Yoga for Peace' event here on Thursday, Modi had elaborated how football connected the two countries.